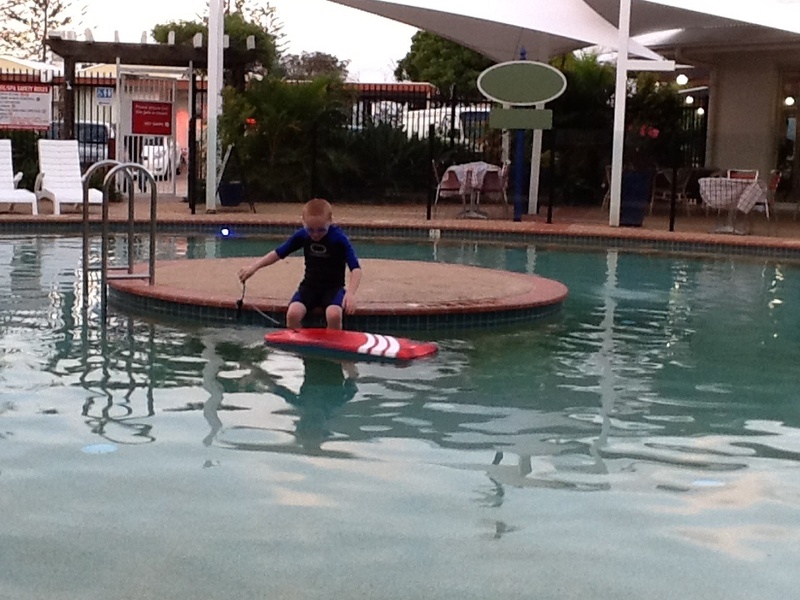 It is just great being able to get away as a family and relax together, although with kids aged 10 and 7 years, they are wanting to be on the go a lot. The weather has been quite overcast at times, not the sunny warm weather that you would expect up here at this time of the year. Still, it has been warm enough to go swimming a lot. Our family loves to swim. The kids are both competent swimmers, having had a number of years of lessons. Princess joined the local swim squad last summer as she was a competent enough swimmer with great times for freestyle, breaststroke, backstroke and butterfly. Over winter she is participating in stroke correction classes as the squad has a break for five months, then another seven months of three nights per week training and one race night each week. I love seeing her times improve dramatically with all the extra training. One thing we have noticed though, is that even though she is a very competent swimmer in the pool, surf swimming is another matter. Thus, we have spent most days in the surf on this holiday, with our body boards, loving fighting the massive waves that are sweeping in from the ocean. The great bonus is that the kids are both getting some practice at surf swimming and training in watching for rips, turbulent water etc. We are also keeping a watch out for a surf lifesaver who may perhaps be able to give them some extra pointers for an hour or so. The skate park across the road has been great for them to get out on their scooters and try out some new manoeuvres. We have skate parks back home but there always seems to be other priorities with our time so we don’t ever seem to get to them. The weekend was spent catching up with some good friends. Hubby and I were good friends with this couple before kids. Life took us separate ways. They ended up living overseas for a number of years. We were busy with ministry, having kids, commencing a business, life, etc. Two years ago, they shifted back from overseas and up here to Queensland, Australia and we have reconnected with them. Their youngest is a girl 9 month older than Princess and the two get on fabulously. They spent the day together on the weekend and then us parents & the rest of the kids connected over dinner. This family is what I call a “life-giving” family. We come away encouraged, built up, excited to have spent time with them. They are not draining at all. I love “picking” their brains about raising kids as they have two older boys as well and their heart is for healthy families. The proof is in observing their kids and seeing some great kids developing and maturing into healthy young adults. Do you have a number of “life-giving” families that you spend time with? Is it time you reconnected again? With the weather so overcast, it has meant that we have had time to read a lot. With a local library only half an hour walking distance away, we have made use of being able to borrow heaps of books. Plus, it is always interesting to look at a fresh collection of books and discover some new books we haven’t read before. It is also on the local bus route. Matey loves the bus ride. One thing I am aware of also is that back home, there is never any need for us to take a bus ride. Whereas up here, we don’t have a car, so Matey loves it if we get on the bus. Princess loves the royal family so we managed to find a number of books on English royalty in different time frames in history. She has enjoyed reading them. 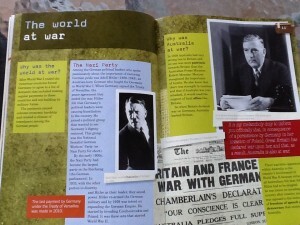 They are a great way of learning history. This library has a great selection of nonfiction children’s literature. 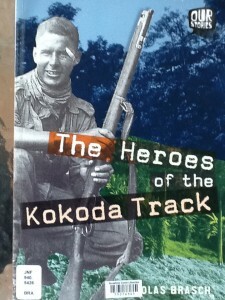 I also borrowed a book called “The Heroes of the Kokoda Track” by Nicholas Brasch. (Published by Black Dog books in 2011), part of the “Our Stories” Series. 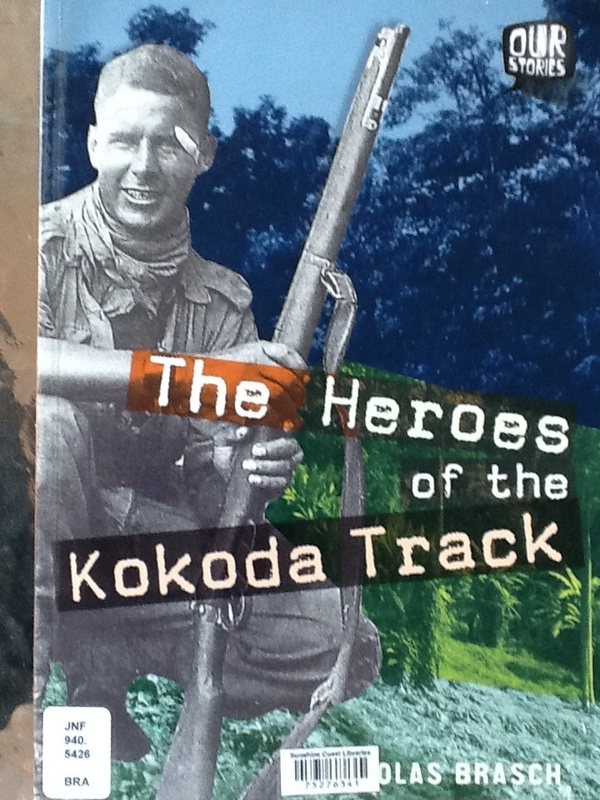 It is a fantastic book explaining the Kokoda campaign in Papua New Guinea during 1942 to save Australia from being invaded by the Japanese. It is more like a magazine than a book with how it is set out in an easy to read way, short paragraphs, heaps of illustrations and easy to read charts, timeline and maps. It briefly covers how World War 2 started and the war in the Pacific so far, along with how vital Papua New Guinea was in protecting Australia from a Japanese invasion. It then goes on to explain the track, and how hard it was for the soldiers, even down to the colour of the uniforms were wrong for that part of the world. Specifically aimed at kids 8-12, I would highly recommend it to those wanting a brief look at the role of Papua New Guinea during World War 2 or wanting something about the Kokoda Trail for kids to understand. It also covered the role of the Fuzzy Wuzzy Angels and their significant contribution. This has been a hit as well. My kids have a particular interest in what happened in Papua New Guinea during World War 2 as my Great Uncle was a ‘Coast Watcher’ during that time up there. He had Japanese soldiers walk over the top of him several times but lived to tell the story. 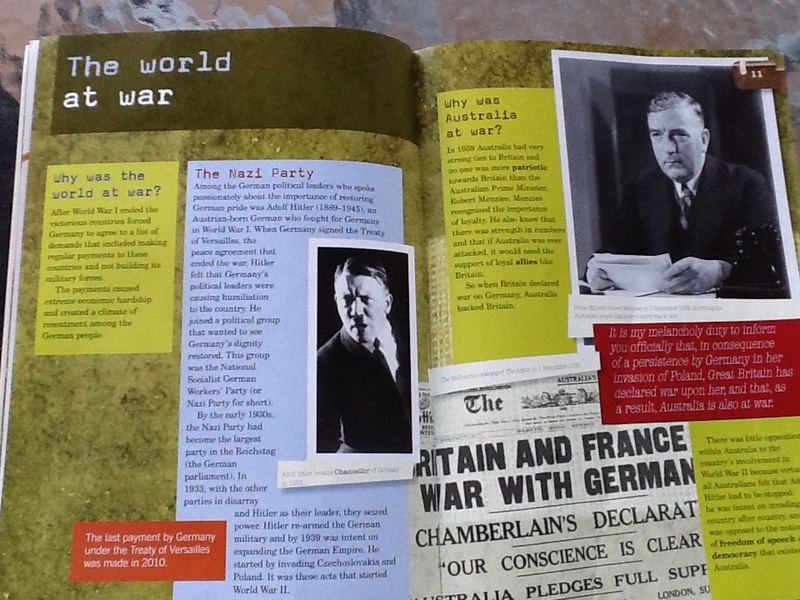 Thus, the kids love hearing and reading anything about what happened there during the war. I love the facts the kids then sprout. Princess started talking about Prime Minister John Curtin and how he died in office. She then talked about how Harold Holt also died whilst in office. After our visit to Canberra in June, she has been a lot more interested in Australian politics and history. 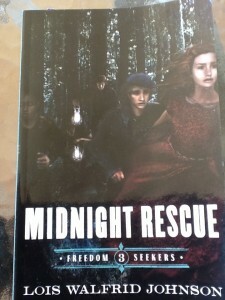 The suspense book I mentioned last week is called “Midnight Rescue”. 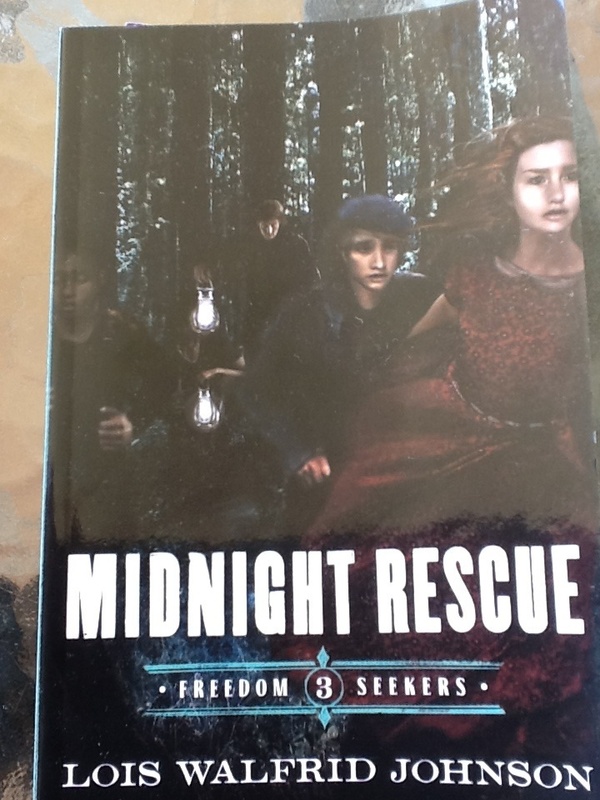 It is book 3 in a 4 part series titled “Freedom Seekers” by Lois Walfrid Johnson. It is about a fugitive slave and how people on the Underground Railroad helped Jordan, the runaway slave, to free his family from being slaves. Matey loved having this read to him and we ended up reading nearly half the book on the last night because it was too exciting to not finish it and we wanted to find out what happened. The card games we brought with us have also continued to be a big hit with the whole family. We are playing a whole lot more games than we usually do, plus hubby has the time to join in as well. They are not only a lot of fun and a time of family bonding, but the kids learn a lot whilst playing – strategy, counting, the ability to think and plan moves in your head, winning and losing, taking turns, coping with frustration etc. “Phase 10″ is Princess and my favourite game together whereas hubby and Matey love playing “Travel Rummy”. Princess sat the annual AMC (Australian Mathematics Competition) for her year level. This is administered though the Australian Mathematics Trust. This is her second year at sitting it and it is not only a great indicator for me of roughly how she is going mathematically but it is also great practice at sitting for exams. One of the pitfalls of homeschooling is the whole lack of sitting tests/exams and the resultant lack of time management when they do need to sit a test. The sense of urgency when sitting a test can easily be missed. Another pitfall of homeschool is that it is hard to gauge exactly where they are at academically as you can’t compare them to twenty plus other students in the same class. Last year Princess came in the top 3 for years three and four throughout Australia and she was only in grade three. The trouble with going so well is that you then expect her to do as well each time. We don’t find out the results for a couple of months but I was impressed with the way in which she was able to answer just about every question. I believe that using ‘Singapore Maths’ as her Maths curriculum has helped as Singapore Maths uses wordy questions and the program is aimed more at helping students to think laterally. When we are on holidays, the kids love sending postcards to their friends back home. I am more than happy for them to do this as it is great practice at writing and addressing letters. Princess has shopped for her postcards, written, addressed and sent at least five postcards so far. Spending several hours in the pool each day with the kids has been great. Matey and I have played a lot of games in the pool with a soft tennis ball and it has been exciting to see how his hand-eye co-ordination and balls skills have improved with just a bit of practice in a fun way. The fire alarm at the resort went off last night just before dinner time. The resort had to implement its evacuation plan and the fire brigade turned up. It was great practice for the kids and raised great discussion about what to do in a fire and our role. One of the kids had panicked a bit and had begun to shout to direct us where to go, so it was a great learning experience for that child.